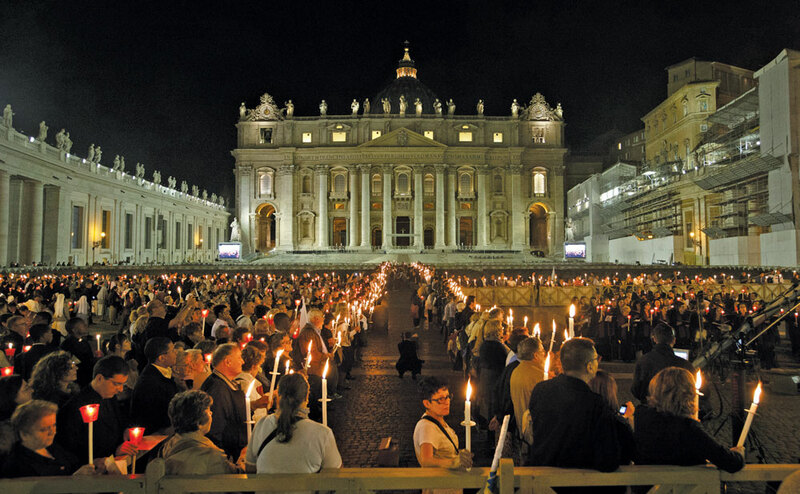 Do This In Memory of Me: Vatican II calls us to a renewed realization of the primacy of Christ. One reason for the tendency of most people to study individual documents is, undoubtedly, sheer human limitation. We clearly need to concentrate, even to specialize. Students of the church will understandably focus on “Lumen Gentium,” while those concerned with issues of social justice will appeal to “Gaudium et Spes.” So far, so natural. Although Father O’Malley is too polite to suggest it (at least directly), the danger of this practice is that there may lurk beneath this neglect of the “integral corpus” of the council, a sectarian disposition, a virus called “cafeteria conciliarism.” And this, of course, is a temptation that afflicts both right and left. The remedy, then, is a catholic, that is, a comprehensive reading of the council documents, both their letter and their spirit. I very much share Father O’Malley’s persuasion. The council indeed “democratized” the injunction to holiness. As “Lumen Gentium” (No. 40) declares: “all the faithful of Christ, of whatever rank or status, are called to the fullness of the Christian life and to the perfection of charity.” This constitutive vocation of the disciple transcends and unites particular callings within the church. At the same time, this call is less a “privilege,” something about which one might boast, than a responsibility, a response to a call that evokes both gratitude and awe. I would like, however, to complement Father O’Malley’s insight with a further observation and reflection. As significant as the call to holiness is for our appreciation and appropriation of the conciliar letter and spirit, an even more pervasive and determinative theme is that of the lordship of Christ: Dominus Iesus. Not only does Christ himself originate the call to holiness; he makes possible our response. As the council confesses in “Lumen Gentium”: “For Christ the Son of God, who with the Father and the Spirit is praised as being ‘alone holy,’ loved the church as his bride, delivering himself up for her. This he did that he might sanctify her. He united her to himself as his own body and crowned her with the gift of the Holy Spirit, for God’s glory” (No. 39). Put in terms borrowed from Karl Rahner, S.J., Jesus Christ himself is “the condition for the possibility” of the church’s holiness, the head whose Spirit enlivens the members of the body. Now this confession of Christ’s primacy may seem only too evident, something all take for granted in receiving and appropriating the documents and the spirit of the Second Vatican Council. Yet I have not found this to be the case. Too often the primacy of Christ has suffered benign or even intentional neglect. In my experience, even informed Catholics, as well as some catechists and theologians, fail to pay sufficient heed to how Christologically saturated the documents of the council are. Failure to recognize the council’s pervasive Christocentrism does scant justice to the council’s “integral corpus.” Slighting the council’s defining orientation to Christ risks embarking on a misdirection from the very outset. Let me indicate a few instances of Christological deficiency that I have noted over the years. The Latin title itself, “Lumen Gentium,” of the council’s “Dogmatic Constitution on the Church” is not infrequently taken as referring to the church. One hears, in a derogatory tone: “How can the church, with all its faults, claim to be ‘the light of the nations’?” Of course, the council makes no such claim. It is Christ who is the light of the nations. The church seeks only to bear witness to her Lord—and sometimes fails. One experiences another instance of forgetfulness of Christ in many of the overheated debates regarding the council’s liturgical teaching. Many rightly quote the council’s desire, expressed in “Sacrosanctum Concilium,” that “all the faithful be led to that full, conscious, and active participation in liturgical celebrations, which is demanded by the very nature of the liturgy” (No. 14). But too often such advocacy is divorced from a deep appropriation of what “Sacrosanctum Concilium” actually teaches about the “very nature of the liturgy” earlier in its exposition. There the council declares, “the church has never failed to come together to celebrate the paschal mystery: reading ‘in all the scriptures the things referring to Christ,’ celebrating the Eucharist in which ‘the victory and triumph of his death are again made present,’ and, at the same time, giving thanks ‘to God for his unspeakable gift’ in Christ Jesus, ‘to the praise of his glory,’ through the power of the Holy Spirit” (No. 6). Thus the “full, conscious, and active participation” at stake is our participation in the paschal mystery, the death and resurrection of Jesus—a much more challenging and compelling prospect than the parceling out of ministerial responsibilities, however important these may be. A further area where recovery of the council’s centeredness in Christ is imperative lies in the church’s social teaching. The “Pastoral Constitution on the Church in the Modern World” (“Gaudium et Spes”) certainly represents an original contribution on the part of the council. But, as Father O’Malley insists in his article, pastoral and doctrinal matters should not be set in watertight compartments, in seeming opposition. What is remarkable about this pastoral constitution is precisely the doctrinal foundation it lays for its commitment and concern. That foundation is strikingly Christological. For the Word of God, through whom all things were made, was made flesh so that as perfectly human he would save all human beings and sum up all things. The Lord is the goal of human history, the point on which the desires of history and civilization turn, the center of the human race, the joy of all hearts and the fulfillment of all desires. Action on behalf of justice finds its deepest meaning and surest orientation when informed and transformed by the knowledge and love of Christ. A final consideration regarding the neglect of the Second Vatican Council’s Christological substance focuses upon the reception accorded its “Dogmatic Constitution on Divine Revelation” (“Dei Verbum”). The rejection by the bishops, in November 1962, of the preliminary schema (prepared by the preconciliar Theological Commission) marked a decisive turning point in the “event” of the council. The document approved by the vast majority of bishops three years later offered a much deeper and more demanding understanding of God’s revelation. As the bishops expressly desired, “Dei Verbum” presents an approach to revelation that is biblical, dialogic and personalist in style and content. And at the heart of the council’s vision is its profession that “by this revelation the deepest truth about God and the salvation of humankind shines forth for us in Christ who is the Mediator and at the same time the fullness of all revelation” (No. 2). My impression, for a number of years now, has been that this robustly Christocentric understanding of revelation has provoked embarrassment in some quarters. I have read expositions of “Dei Verbum” in which there is no mention of Christ’s being “the fullness of all revelation.” If I may be allowed a sad levity: Leaving Christ out of the exposition of the council’s teachings is like offering a recipe for pane di casa, but leaving out the leaven. The thrust of these reflections has been that, deeper than the recovery of the universal call to holiness, there is a still more radical and energizing ressourcement: the return to the unique source, who is Jesus Christ. This renewed realization of the primacy of Christ, discovered not merely by repeating preconciliar formulas, but by beginning to fashion a more existential and experiential Christological language, constitutes the true spirit of the council, permeating its documents but always pointing beyond them to the reality of the inexhaustible mystery of Christ himself, the light of the nations. Since Jesus Christ is, indeed, the light, the hope and the joy of all peoples, the council’s “Decree on the Missionary Activity of the Church” (“Ad Gentes”) exhorts Christians generously to share the good news. “This holy Synod...wishes to muster the energies of all the faithful, so that the people of God, advancing along the narrow road of the cross, may spread to all parts of the world the kingdom of Christ, the Lord and Overseer of the ages, and prepare the way for his coming” (No. 1). And the motivation impelling this missionary commitment is clear: “All have need of Christ, their model, mentor, liberator, savior, source of life” (No. 8). Such is the Christological foundation and direction the council sets. It sounds for all the world like a summons to a new evangelization. This article also appeared in print, under the headline "Do This In Memory of Me," in the April 22, 2013 issue. Rev. Robert P. Imbelli, a priest of the Archdiocese of New York, teaches theology at Boston College. He was on the founding committee of Cardinal Joseph Bernardin’s Catholic Common Ground Invitiative.